We've always promised the kids that they will never have a pet, so long as they live under our roof. Mostly because Krista is allergic and the kids (though they would rather have their teeth pulled out than admit it) are also allergic. 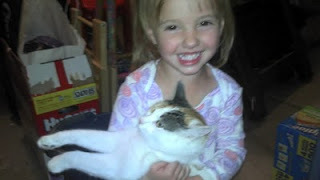 But after we briefly cared for a lost kitten this spring, we caved and told the kids they could get a kitty. So, introducing out new pet, who was supposed to be an outdoor cat but is terrified of the outside and thus is living nights in our garage and being forced to face her terror during the day. Her name (get ready for it)... Her Majesty Princess Amber. I call her "kitty" or sometimes "scaredy cat." As you can see she lets the baby do whatever she wants with her. In fact, the other day M picked the cat up in a full on WWF stranglehold and the cat immediately started purring. She fits in fine around here. Ever since getting a cat about 11 years ago, I've gained appreciation to several aspects of our creature-creator relationship with God. Hopefully Amber will get written in one of your future stories! Amber is really smart...she's figuring with a smile like M's...M is sure to convince you into puttting an end to the sleeping in the garage arrangement!